The land of ZX80 clones is well populated. The first one I was aware of was made by Grant Searle in the 90s. Grant spent many years reverse engineering classic Z80 based machines and also produced a 'make your own Jupiter Ace' page along with his ZX80 replica. Grant's pages are the go-to place if you want to produce your own modern copy. Over in the Czech Republic (as it was then) a bloke called Martin Lukášek produced a kit based on Grant's work (and presumably asked nicely) then sold it on ebay for a very reasonable €80. 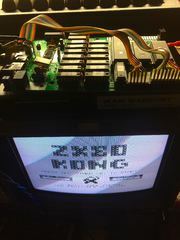 Subsequently he's added the NMI modifications needed for ZX81 'slow' mode and a real-ish keyboard. Last year (2016) Dave Curran up at Tynemouth Software started reworking the original ZX80 schematic and in January this year launched the Minstrel, a ZX80 clone but in the form factor of the ZX81. 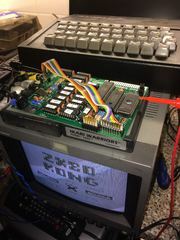 Additions to the original were internal 16K RAM, composite video output for both PAL and NTSC and jumper selectable ROMs thanks to externally accessible A13-A15 address lines for the necessary 27c512 EEPROM. This means you can have several different ROM images present for instant access to the ZX80 ROM or a ZX81 ROM in 'fast' mode. A jumper also allows the display to be inverted for white-on-black as a default. 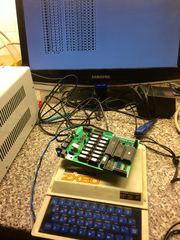 Dave's Minstrel doesn't include a keyboard but thankfully Rich Mellor at RWAP Software has been producing replica ZX81 keyboard membranes for several years so that's an easy fix. In addition to this Nottingham based tinkerer Semachthemonkey has been producing his modular Z80 based BASIC machine called the RC2014 for a while now and Dave has added its keyboard to the Minstrel roster.